Thanks to the continued focus on Safety and Environmental responsibility by each and every member of the team, this summer saw Gulf Coast Signs reach another safety milestone, ten years (3650 days) of work performed without Loss Time Injury. 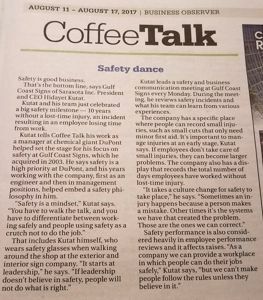 The Business Observer, a weekly newspaper for business leaders on the Gulf Coast of Florida also took note and included an article highlighting our achievement. A safety and business communication meeting at Gulf Coast Signs every Monday serves as a platform to review safety incidents and what our team can learn from these various experiences. Safety is part of our culture and will remain so every day as we move forward to many more milestones.